Don and Judy love to travel. Whether it’s a cruise on the Baltic Sea or a road trip to discover tucked-away surprises, they relish the adventure and each other. They’ve been married three years, and the roadmap which led to the intersection of their individual paths is filled with unusual twists and turns. Each had been married before. Don’s first wife of 48 years, Peggy, had a life-debilitating disease which caused extreme hardships and eventually ended with her death. Judy’s first husband, Elwin, was murdered shortly after their silver wedding anniversary. Through each of their life trials, Don and Judy credit the Lord for His strength, wisdom, and faithfulness. Don and Peggy were young and eager to serve the Lord. After they married, Don became the minister of music at a church in Grand Rapids, Michigan. After three years, they moved so Don could further his church music education at Southwestern Baptist Theological Seminary in Fort Worth, Texas. Peggy started to cough frequently, the first hint of her life-threatening disease called myasthenia gravis, extreme muscle fatigue. This led to numerous bouts of pneumonia and multiple extended hospital stays over the years. Their marriage was blessed with four children—two adopted and two biological. With a busy family, Don’s music ministry, and Peggy’s constant health concerns, life wasn’t simple. However, God answered Don’s prayer for perseverance through it all. Peggy eventually passed away after a courageous battle with daily challenges. Elwin and Judy were married in 1968, had two sons, and were happily serving the Lord at SpringHill Camps in Evart, Michigan. Elwin was the facilities manager and Judy worked as head registrar. The day before Easter in 1994, Elwin had driven to the Detroit airport to pick up his mother who was returning from Florida. He arrived early, so he waited in a restaurant parking lot near the airport. Two men approached his car with the intention of robbing him and ended up shooting him. Although the shock of the murder and the ensuing trial were brutal on Judy and her family, she turned to God for strength and answers. “One night during the trial I wasn’t sleeping and I started to write a letter to the fellows. I expressed how I knew that I was going to see my husband again because of his relationship with Jesus and his love for God,” Judy relayed. She gave a letter and a New Testament to the prosecuting attorney to give to each of the accused men involved in the murder of her husband. Both men were found guilty of felony murder and received life without parole. After the sentencing the judge called Judy back to her quarters and said, “Normally on sentencing day the atmosphere is pretty bad. That was not the atmosphere today.” The judge indicated that she had never seen anything like that before, and she could tell that Judy’s loving act of grace made the difference. Over the years, Judy has been surrounded by wonderful Christian support through family, friends, church, and work. She continued to work at SpringHill Camps until she retired in 2008 and now continues to work part-time as a travel agent. A mutual friend of Don and Judy’s, Judie Schmachtenberger, tried to play matchmaker. “I told Judie, ‘No, I’m not interested at all.’ I’d been a widow for twenty plus years and totally content in my life and didn’t need a man to complicate it,’” Judy recalled with a laugh. But when Judie received similar Christmas letters in 2014 from Don in Arizona and Judy in Michigan, she knew she couldn’t give up. She saw similar interests in the Lord, choral music, and travel, and suggested the two exchange these letters with each other to see how much they had in common. And that’s when things changed. They began exchanging emails and talking on the phone. By February, Don suggested that Judy come visit him in Arizona. “Well, it was below zero in Michigan, and it was 70 down there,” Don quipped. Their friends the Schmachtenbergers were also visiting Don at the same time. “They were our chaperones,” Don chuckled. The couple met each other’s children and visited the graves of their spouses. They embraced each other’s lives as they prepared to create a new one together. They were engaged at a special dinner with Judy’s son’s family on June 10, 2015, and were married December 5 surrounded by 150 close friends and family. They spend winters in Arizona and summers in Michigan, and they enjoy each other’s company and traveling as much as possible. “She loves to explore and discover,” Don said. “Our road trips are just wonderful because of that; this is an amazing woman!” And Judy slyly added, “Another amazing thing is that Don is not afraid to turn around! He makes U-turns and asks for directions!” They both laughed, just knowing how good it is to have each other, and grateful to the Lord for making it all happen. Through our Service Partner program, volunteers help Our Daily Bread Ministries accomplish our mission. 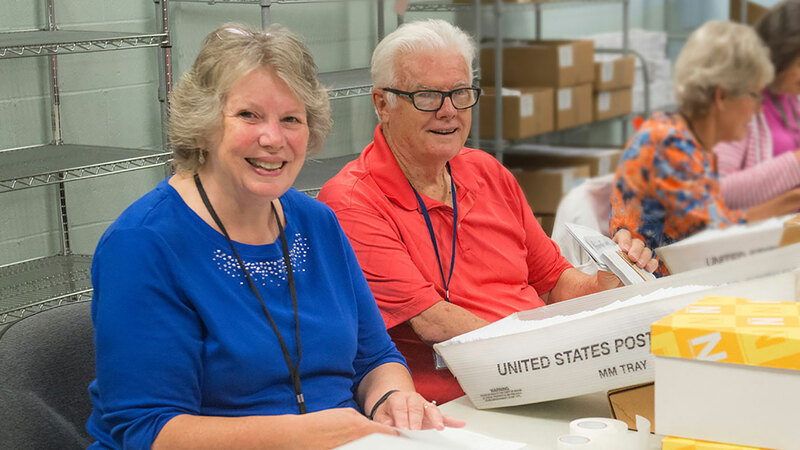 Our Service Partners bring a variety of skills and help in various functions, but our biggest need is for partners to help stuff our mailings and fulfill customer service orders. We average about 140 people who help us out on a regular basis—a few hours a week as their schedule permits. If you’re in the Grand Rapids area and would like to be a Service Partner, please go to ourdailybread.org/volunteer or call 616-974-2210.